The genus Lethe which features some very rare butterflies in Malaysia and Thailand, is represented by only one species in Singapore. This is Lethe europa malaya or the Bamboo Tree Brown. 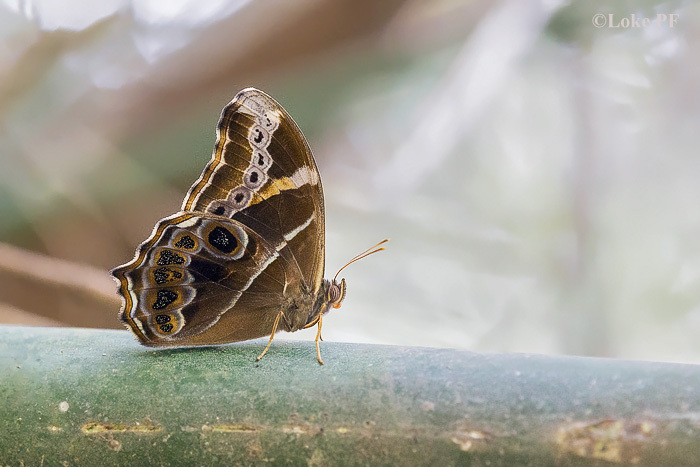 Its common name obviously suggests that the butterfly is associated with bamboos - its caterpillars feed on certain varieties of bamboo in Singapore. It is a shy butterfly, alert and skittish, and is often found lurking at low level amongst bamboo clumps. The underside of the Bamboo Tree Brown features cryptic markings and an attractive series of lilac ocelli on the wings. This individual was photographed by ButterflyCircle member Loke PF at Butterfly Hill on Pulau Ubin.